PALMDALE – The Palmdale Sheriff’s Station is seeking your help in locating the following suspect. If you recognize him, or know where he might be located, contact detectives using the information next to the suspect’s photo or by calling 1-800-222-tips (8477). 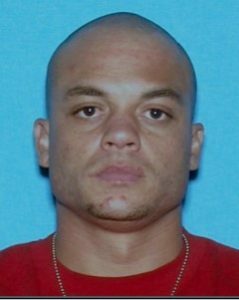 Joseph Stanford is a 33-year-old man with brown eyes and a possibly shaved head. He is approximately 6 feet tall and weighs around 200 pounds. 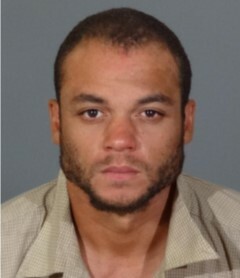 Stanford is wanted for aggravated mayhem and arson. He is accused of setting his girlfriend on fire and causing serious injury in an incident that occured May 19, 2018. There is a $1 million warrant for Joseph’s arrest. He is known to live in the Antelope Valley. Anyone with information on the location of Joseph Stanford is encouraged to contact the Palmdale Sheriff Station at 661-272-2400. 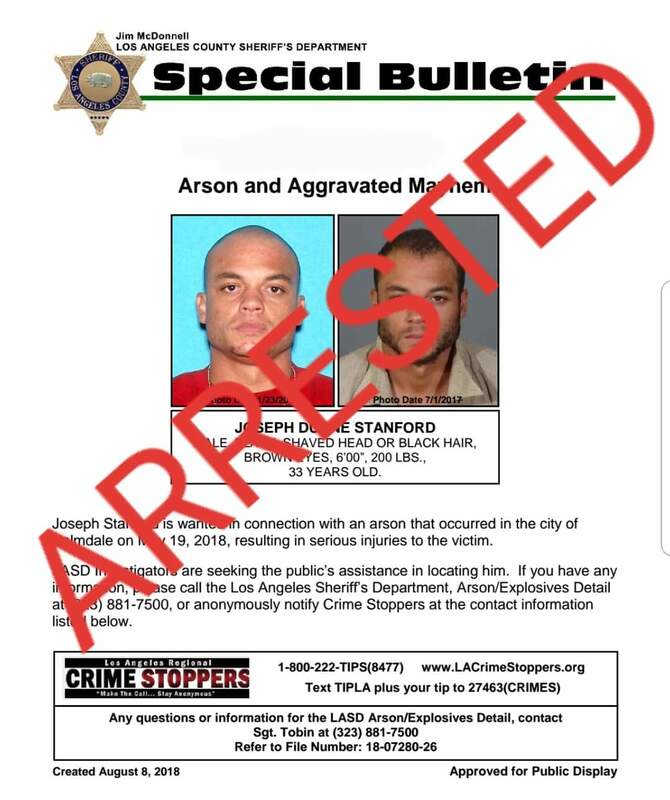 UPDATE: Joseph Standford has been arrested, according to the Los Angeles County Sheriff’s Department, which sent out the image below. 28 comments for "Palmdale Station’s Most Wanted [update: suspect arrested]"
If you are going to comment please use a dictionary to spell correctly. Or go back to school. What is this, dat, and dos, and whos, geez people. Learn how to talk. Your just justifying uneducate d.
It’s always hilarious when someone tries to play grammar cop while demonstrating that they themselves have zero command of basic English. It isn’t hilarious when someone plays “thought police,” calling out a grammar cop. Yep, “thought police” attacking any commenters that think differently than they want you to think. Like the people who just knee jerk attack pretty much anything I say. Like you for example Julia. Tim Scott, what is your hate mail email address? His hate mail email address is bogus. always has been. LOL…FZ, why tell lies that are easy to prove as lies? All someone has to do is send an e-mail to timshatemail@gmx.com and they will know you are a liar. You don’t look anyone in the eye. You don’t meet anyone for coffee. It’s easier to stay anonymous because someone would give you a serious beat down over that confrontational mouth of yours. I notice that you haven’t sent me an e-mail FZ. Why don’t you give it a try? See how easy it is for anyone who is interested to prove you are lying. Of course all the people who have e-mailed me know you are lying. Why don’t you try it FZ? I just sent you an email Tim. @David G and John, what a couple of idiots you are. This is not something to make fun of. My friend is a mother of two and her life is never going to be the same. She is still suffering through all of this and will be for a while. Take your stupidness some where else. Kat, take comfort in the fact that no matter where they go their stupidness is there to torment them. Don’t hate if Cuzz slaps da old lady dat is how dey do it in the hood…. This article is about a person that is accused of setting his girlfriend on fire. Stanford is wanted for mayhem and arson. Thankfully aggravated mayhem holds a life sentence, no need for an attempted murder charge. What do you expect when the Lancaster mayor sends out political hit mailers calling an African American veteran a ‘gang candidate’? Racist comments and thinking are part and parcel in Rexville. Of course you will get racist comments from local ignorant uneducated AV Yokels. What do you expect when the mayor of Lancaster sends out racist hit mailers calling an African American veteran running for office a ‘gang candidate’? Or when he flips out over a dead Muslim being buried in an unmarked grave? Or when he refused to go to district voting to have his Hispanic and African American east side represented? Maybe you should go where blacks and Mexicans care about you. In this stinkin town, a black and Mexicans idea of equality is being able to stick their nose in your business without being shunned. I’ll stick with racism and keep my privacy and my business to myself.